Two colleagues of mine, Susan and Christine, had a great idea! They wanted to do a virtual field trip in Second Life for students in a graduate course they are designing. However, they didn’t want students to have to get their own Second Life account in order to experience the field trip. So they wondered if they could ‘record’ the instructor experiencing the field trip and simply show the recording to the students. We developed a proof of concept for this solution to show to the instructor. 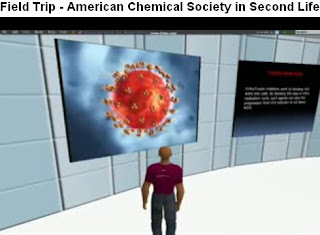 It is a short, less than a minute, video showing a virtual field trip in Second Life to the American Chemical Society. We've hosted on YouTube. You might be wondering how I did it? Well, I used a four step process. Capture the video in FRAPS while in Second Life. FRAPS does a full screen capture of what you see in Second Life. It even captures streaming video clips with audio that are playing in world. The full version of FRAPS is only $37. The free version allows you to make video capture clips up to 30 seconds in length. I recorded some audio to overlay on top of the video capture. I used Audacity. It’s a free audio recording software. I then used Windows Movie Maker to put the video, the audio and a couple of title slides together into the final movie. Windows movie Maker is free and is pre-installed with Windows XP and VISTA. Look for it under Start -> All Programs. I uploaded the final movie to YouTube. All told it took me about 2 hours to make this video and write this blog posting. Not bad for a proof of concept. Have you used these types of techniques successfully in your distance courses? If so, let us know about it. That is uber cool! Smart!